What will watershed protection look like? The board passed the Ordinance 5-0 with some minor clarification modifications. NVR 4/9/19: Napa County passes controversial tree and water ordinance, so what's next? Another meeting and a chance to nibble away more protections. It was unfortunate that the wine industry/homebuilder lobby badgered the Supes to throw out the ban on development over 30% at the last hearing. If the rationale was that so little is being done there now that protection is not warranted, then what harm would the protections do. The home builders and estate developers know that as land becomes more scarce, development will move up the slope. The Supervisors continue to refuse to address problems until they become unsolvable. The protection is needed now. In the most consequential comment of the day, Dir. 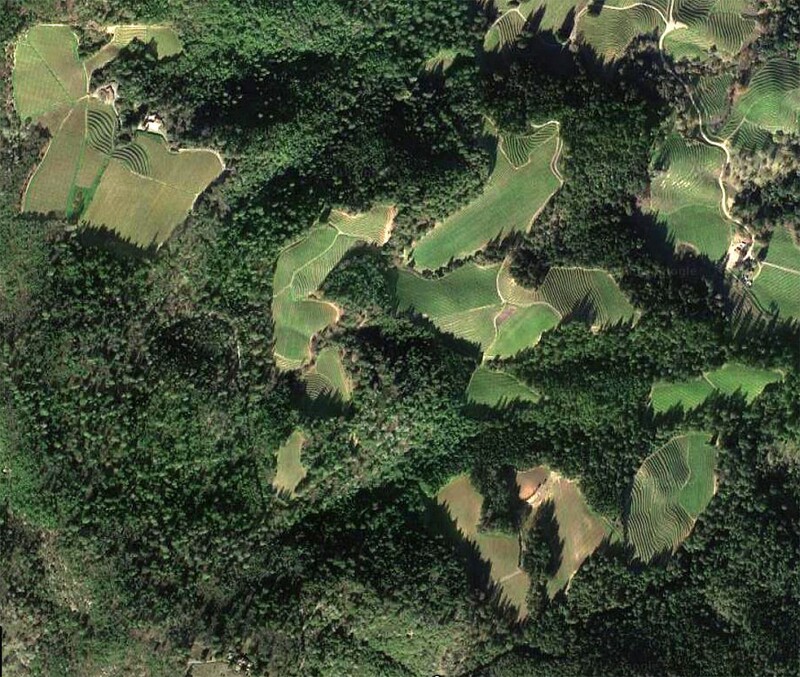 Morrison itemized the county development on slopes over 30% in the last fifteen years: 5 houses, 4 wineries, 0 vineyards. This, unfortunately, was interpreted by some supervisors as indicating that banning development on slopes over 30% was unnecessary, and the provision was struck from the ordinance, evidence-based decision-making in action. The ban was labeled a solution looking for problem, a charge made by many opponents about the entire ordinance. Of course the counter argument could have also been made: if so few things are developed on slopes greater than 30%, then little financial impact will occur to insure that much land will be conserved into the future. As usual the Supervisors were waiting until a problem was beyond solving, like ridgeline houses or traffic congestion, or a landscape littered with buildings, before they would agree to consider it. The fact that several realtors made the impassioned argument that the 30% ban would impede their ability to develop homes in the hills seemed to be clear evidence of a potential problem. In fact, one real estate agent cited the necessary zig zag gashes on the steep hillsides of Soda Canyon needed to get to the ridgeline homesites overlooking Stags Leap and the Napa Valley. The Supes didn't see that as a problem and caved to the home builders. The result of all the fire and fury over Measure C, as happened with Measures O and P a decade and a half ago, were some very modest Supervisorial tweaks to policy. The notion that the now obvious relationship between environmental stewardship and the looming extinction of life on earth would change the calculus in the battle between developers and conservationists, and concentrate minds wonderfully, was, alas, put off for another day. Discussion returns to the Board of Supervisors on 3/26/19. Agenda and documents are here. Little changed from the Supervisors proposed conditions (see here). There were modest tweaks to the very modest proposals that the Supes had sent them. Neither the tree-cutters nor the tree-huggers were happy - which probably means the County in their "sausage making" (Dir. Morrison's term) felt they got it right. The property rights lament has been at the heart of land policy opposition since the original Ag Preserve, and a segment of the wine industry, as they did in 1968, again harped on the potential victimhood here. It seemed as though the vintners had forgotten their historical animus against home builders in their fury to fight a bigger enemy: "environmental activists". They also seemed to forget, as they have in other debates over the last few years, that the denial of property rights was the essential element of the Ag Preserve legislation that made it possible for the wine industry to survive into the 21st century. After Measure C, in which the industry spuriously argued that restrictions on watershed development would lead to more housing in the hills, it was interesting that they now seemed to tacitly support the argument that watershed restrictions would decrease housing development there. Politics makes strange bedfellows. The ordinance will return for a final decision to the Board of Supervisors on March 26, 2019. The Planning Commission will take up the discussion again on Wed., Mar. 6, 2019. The agenda and documents are here. On Wed, Feb 20, 2019, 9:00am, the County Planning Commission will take up revisions to the Conservation Regulations sent them by the BOS. Public comments are welcome - a full house is expected and the hearing may be extended to Feb 27 if needed. The meeting agenda and documents are here. David Heitzman: Data-driven decisions or simply propaganda? Mike Hackett: The Science is Clear: Our Future is Not. County staff has produced a markup of a proposed "Water Quality and Tree Protection Ordinance" amending and adding sections to the County ordinances governing watershed development, to be submitted to the Planning Commission on 2/20/19. The title of the ordinance, the "Water Quality and Tree Protection Ordinance", is a more tactical description than the philosophical "Watershed Protection Ordinance" previously used. The Conservation Regulations that the ordinance will change are principally about land clearing operations and their impact on soil and surface water runoff. They do not deal directly with the equally important function of watersheds in feeding subsurface aquifers that, as springs, add to the surface water supply and that are pumped out to irrigate the increasing number of vines in the watersheds. While canopy retention may be a metric of aquifer contribution, the Conservation Regs are largely silent on the impact of vineyard conversion on the sustenance of the aquifers (beyond one reference to Phase I water availability analysis which, in fact, no longer applies to the watersheds). That issue is now under scrutiny of the County in its Groundwater Sustainability Analysis. It is doubtful that such modest tweaking of the Con Regs will do much to change the current development trajectory of wild lands in the county. It would be interesting to evaluate Walt Ranch, the county's poster child for the inappropriate conversion of a large chunk of unspoiled natural heritage into a vineyard estate project (and perhaps the genesis of Measure C and this ordinance), to see what impact these changes might have had. The easements to protect retained vegetation are a good step. Excluding development on slopes between 30% and 50% may save some areas. One wonders how much of the county is already developed on slopes in that range. But, despite the sound and fury some members of the wine industry (IMO more concerned about who is making the decisions rather than the decisions themselves), the modest changes in setbacks, canopy retention or replacement ratios don't seem like they will be the deciding factors in whether or not to develop. And reducing the development of watersheds and woodlands should be the goal of any new regulations. The Planning Commission will take up the BOS recommendations at their Feb 20th meeting. WOWP Committee 1/28/19: What are the County's values? What are ours? In the June 2018 primary election, Measure C, the Watershed and Oak Woodland Protection Initiative, failed by 650 votes out of 37,500 votes cast. The contentiousness of the campaign was seen by many as not just a vote on the protection of watersheds but a referendum on the pace of development in the county as a whole. The supervisors, mindful of the community split that the vote represented, have renewed a Strategic Plan process to seek out a consensus on County priorities over the next three years. As part of that process, the Supervisors have scheduled a workshop to continue the discussion, or battle, that so divided the County over Measure C, in the hopes that under their leadership a consensus can be arrived at. In fact, a faction of the Napa Valley Vintners help draft the provisions of the Initiative before backing out under pressure from the more aggressive members. A principal complaint by some seemed to be only that it was a citizen initiative rather than the industry-government collaboration that normally leads to new ordinances governing the industry. There should be support from the industry for some changes to the current Watershed Conservation regulations. The potential of another initiative looms if this discussion goes nowhere. A comparison of the options to be discussed is here.